If your dog’s otherwise healthy, but off their food, it’s not always easy to work out why they’re being fussy. •Does your dog look uncomfortable or in pain when they’re eating? It’s possible there’s something wrong with your dog’s mouth or throat, so get them to the vet. 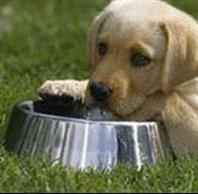 •Is your dog getting enough chance to walk off their food? If they don’t always get a regular walk, it’s time to start. •For puppies, it could be because they’re teething. If your puppy’s stepped up their chewing activity, teething pain could be the reason. Try mixing some dry food kibbles in with their usual wet food and offer them puppy safe toys to chew. •Has your dog’s food been left out for a while? It’s probably just lost its flavour, just like our food would. •Are you trying a new brand or new flavour of dog food? Abrupt changes can lead to vomiting or diarrhea, so switch foods by weaning gradually over the course of a week. •Can your dog eat uninterrupted? Check that they can eat on their own without being disturbed. Other possible reasons for going off their food include emotional changes – perhaps their favourite member of the family has gone away, or there’s a new pet in the house. If your dog has other symptoms, take them to your vet for a check-up.